After appearing on camera at NXT TakeOver: Orlando, Drew Galloway is headed back to WWE. 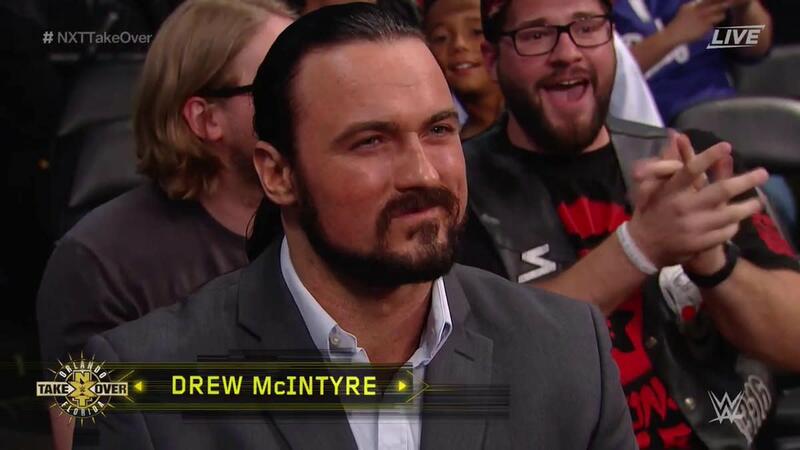 Galloway was shown sitting in the audience at TakeOver and was identified as Drew McIntyre, which was formerly his in-ring name when he was with WWE, shortly before the NXT Championship main event between Bobby Roode and Shinsuke Nakamura began. On commentary, Tom Phillips then asked what McIntyre was doing there. His placement in the front row seemed to indicate a return to WWE, and Galloway confirmed in an interview with ESPN that he has re-signed with the company and will be coming to NXT. Galloway was scheduled to be involved in an elimination match to crown the first WWN Champion at the WWN EVOLVE vs. PROGRESS Supershow on Saturday night, but was laid out by Keith Lee early in the show. As part of a round of roster cuts, Galloway was originally released by WWE in the summer of 2014. He went on to shine on the indies and became a regular in TNA until announcing in February that he wouldn't be signing a new contract with the promotion.